← A Letter To All Students and Receivers of Energy Healing Therapies. This is a great article on using a Reiki Triangle for Manifestation. You can use it for any area of your life (or anyone else’s) where you are trying to make a change. It works for jobs, health, addictions, relationships, money issues, and more. It suggests an interesting way to look at the issues to which you are sending. This includes the problem, solution, and yourself in the same model. The original technique suggested putting the paper in your lap. I suggest doing it in front of you to make it more clear that your feel the energy of the problem and not your body. * Prepare the room and yourself by using some symbols or just saying a prayer. * Use your hands to draw the circle and then the triangle. * Put the appropriate intention into each section of the triangle. * Draw or intend a Distance Reiki symbol over the center of the triangle. * Draw all your Reiki Symbols over the triangle, and then beam Reiki into each section of the drawing. * Notice any areas that need more or less. * Use a power symbol to close. This entry was posted in Reiki Meditaion and tagged addiction, distance reiki, drawing, hand, health, intention, job, manifestation, money, power symbol, prayer, problem, prosperity, reiki, relationship, room, solution, statement, symbols, technique, triangle. Bookmark the permalink. Please let me know…are you Reiki Practitioner? 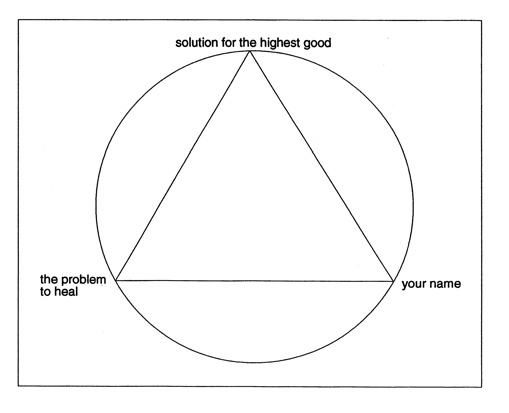 If Yes then I can explain the method in detail as you need to use Reiki Symbols to activate this triangle. “No im not a member but in to be…..”so can be a member…. ?hw tu join. You have to do Reiki Course…..
i would like to know about trangle or using method .i donot understand english properly so please help me i am requesting you please help me. I m from india and i m Reiki practitioner.i m requesting u again and again plz help me. Can a reiki level I attuned do this? No…you can do after Reiki Level II. Can you guide with learning reiki…i had done with level I but id not see much changes…nd i did not get a certificate even…what should i do.? Can we take distance attunement? Yes! You can take distance attunement with certificate…I can teach you and attune you from distance. How can you attune somebody from a long distance!!! I know you can heal long distance! Yes..I am Reiki Master of Higher Level ..
we can connect on gmail…i hv sent u request…plz chk. we can connect on your gmail id…i will give you all details. I’ve used this technique for manifesting for years & it is VERY effective. I draw do a triangle for various goals, people & issues and fold them & put them in my Reiki basket and then each day send distance Reiki to “my Reiki basket” along with myself, others, etc- using a substitution technique that Reiki teaches in level II. You need to have taken courses from a Reiki Master who will attune you & give you the ancient symbols. God Bless.